Intussusception is a telescoping of one portion of the bowel into another portion which results in obstruction to the passage of the intestinal contents and inflammation and impaired blood flow to the parts of the intestinal walls that are pressing against one another. If not treated, tissue necrosis, intestinal perforation, and peritonitis may occur. The symptoms of intussusception include colicky abdominal pain, nausea, vomiting, lethargy, and blood or mucus in the stools (sometimes referred to as “currant jelly” stool). It is most commonly occur in infants ages 3 to 12 months or in children 12 to 24 months of age. The cause of intussusception is unknown but children with Meckel’s diverticulum, celiac disease, cystic fibrosis, diarrhea, or constipation increases the likelihood of incurring this condition. Surgical correction is done if the obstruction of the involved segment does not resolve through manual reduction or by hydrostatic pressure or if bowel becomes necrotic. 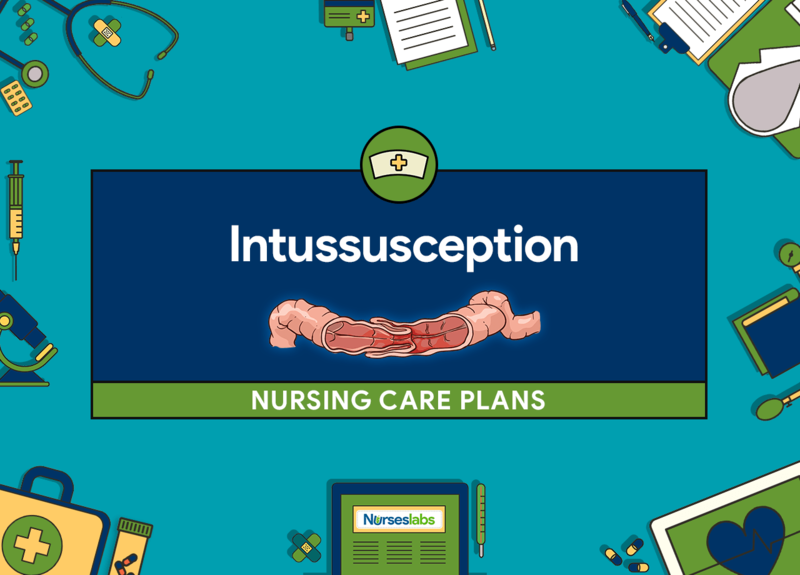 Nursing care planning goals of a child with intussusception revolve toward providing appropriate information about the child’s condition, restoring fluid volume and preventing dehydration, and observing resolution or improvement (relief of abdominal pain, return of normal bowel sounds). Deficient Fluid Volume: Decreased intravascular, interstitial, and intracellular fluid. Child will be able to tolerate age-appropriate foods and fluids without vomiting or recurrence of symptoms and will be free from fluid and electrolyte imbalances. Assess for signs and symptoms of dehydration such as poor skin turgor, dry mucous membranes, irritability, and delayed capillary refill. Repeated vomiting and insufficient fluid intake may lead to dehydration. Assess fluid intake and output. Measurement of fluid intake and output is an important indicator of child’s fluid status. Monitor vital signs as frequently as possible. Vital sign changes such as hypotension, tachycardia and increased temperature reveals hypovolemia. Monitor characteristic of stool (consistency and color). Initially, a child with intussusception may pass a normal stool, but later on, a mucus, blood-filled or jelly-like stool is observed. Suggest and offer infant the use of a pacifier. Sucking on a pacifier may promote peristaltic movement and passage of gas. Administer IV fluids as ordered. Post-operatively, intravenous fluids are continued to re-established electrolyte imbalance and to promote adequate fluid intake. Instruct parents that they may offer clear liquids then gradually advanced diet as tolerated. A clear liquid diet, then progressing to soft diet is given until normal bowel function is established. Provide frequent oral hygiene. Deficient fluid intake can cause a dry, sticky mouth. Attention to mouth care promotes interest in drinking and reduces discomfort of dry mucous membranes.